It’s almost time to request 2019 football season tickets. Like last season, eligible students will have three options for tickets in Memorial Stadium. Season ticket requests for Upper and Lower Deck admission are open on April 8. The cost for Lower Deck tickets is $280 ($40/game), the same as last season. An upper deck season ticket is $175 ($25/game), a reduction of $5 per game from last season. Free single game tickets and a gameday pick-up will still be options in 2019, but no action is required for those at this time. Questions should be directed to custudenttix@clemson.edu and 1-800-CLEMSON. Students enrolled in co-op/internship courses are not considered full time students. In order for these students to become eligible for ticketing, they must pay the $30 Co-Op Activity Fee. Students can pay this University fee at iroar.clemson.edu. A maximum of 5,750 reserved season tickets are available. IPTAY Collegiate Club members will receive an additional point in the Student Point System for each year of IPTAY Collegiate Club membership. For example, a senior with 4 years of Collegiate Club membership would have 8 total points. A senior with no years of Collegiate Club membership would only have 4 points. In order for your Collegiate Club Membership to count in the season ticket allocation you must join by 11:59 PM on Friday, April 19 (The last day to request season tickets). To determine season ticket purchase priority, a Student Point System has been instituted. Students earn points by both credit hour accumulation and IPTAY Collegiate Club membership. Credit hour points: Students will earn points based on credit hours as reported by the Clemson University registrar (0-29 hours = 1 point, 30-59 hours = 2 points, 60-89 hours = 3 points, 90+ hours = 4 points). Graduate students will receive credit hour points based on hours earned at Clemson, including undergraduate hours (i.e., first-year graduate student, earned 124 hours as an undergraduate at Clemson = 4 points; first-year graduate student, undergraduate hours earned at another institution = 1 point). IPTAY Collegiate Club membership points: IPTAY Collegiate Club members will earn one point per year of IPTAY Collegiate Club membership. Should the request for lower deck season tickets exceed availability (4,000) within a group of students with the same amount of points (i.e., 5 points), all students with that point level will be grouped and a simple lottery performed in order to allocate the remaining season tickets. reserved season ticket in the upper deck costs $175 ($25 per game). Students will only be charged if they receive a season ticket. Online sign-ups will begin in August. No action is required for single game lottery at this time. Approximately 4,000 single game lottery tickets are available to students who did not purchase a season ticket. IPTAY Collegiate Club Single Game Ticket Benefit: For the single-game lottery, IPTAY Collegiate Club members will receive an extra entry in the lottery for each year of Collegiate Club membership. For example, a senior with 4 years of Collegiate Club membership would be entered 8 times in the lottery. A senior with no years of Collegiate Club membership would be entered 4 times in the lottery. In order for your Collegiate Club Membership to count in the single game ticket lottery you must join by 11:59 PM on Thursday, August 15 (The last day to request single game tickets). Approximately 250 general admission single game Hill tickets are available each week. If any lower or upper deck season or single game tickets are not purchased or picked up, they will also be included in the gameday distribution. Scannable RFID wristbands will serve as student tickets. To enter Memorial Stadium, students must present their CUID and have their wristband scanned. While each wristband is attached to the CUID of the student who picked up the wristband, any valid CUID combined with a wristband will allow entrance into Memorial Stadium, enabling students to easily exchange tickets amongst each other. However, only purchased tickets can be resold, whereas free tickets from the lottery or gameday pick-up cannot be exchanged for monetary value. Yes! Free tickets are available in every student section so regardless of how you receive your ticket, you have the opportunity to sit with your friends. Tickets are fully transferrable, enabling students to freely exchange tickets with other students to keep friends together. Can I exchange my purchased season ticket with another student? Yes, all tickets can be exchanged with other students. However, only purchased tickets can be resold, whereas free tickets from the lottery or gameday pick-up cannot be exchanged for monetary value. A CUID must be shown to enter game to ensure only Clemson students are using student tickets. Student Government has created and manages a Facebook page to facilitate the exchange of student tickets. What if I need ADA Accessible student tickets? Students in need of ADA accessible student tickets should follow the procedure outlined in this document to obtain student ticket(s). 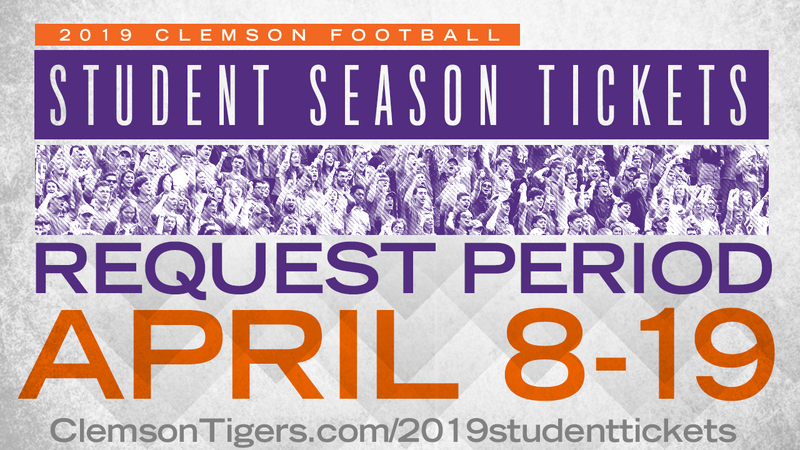 If you receive student ticket(s) and have questions regarding ADA access in/around the stadium or your seat assignment, please contact Student Accessibility Services at STUDENTACCESS@LISTS.CLEMSON.EDU or 864-656-6848. What is the IPTAY Collegiate Club? 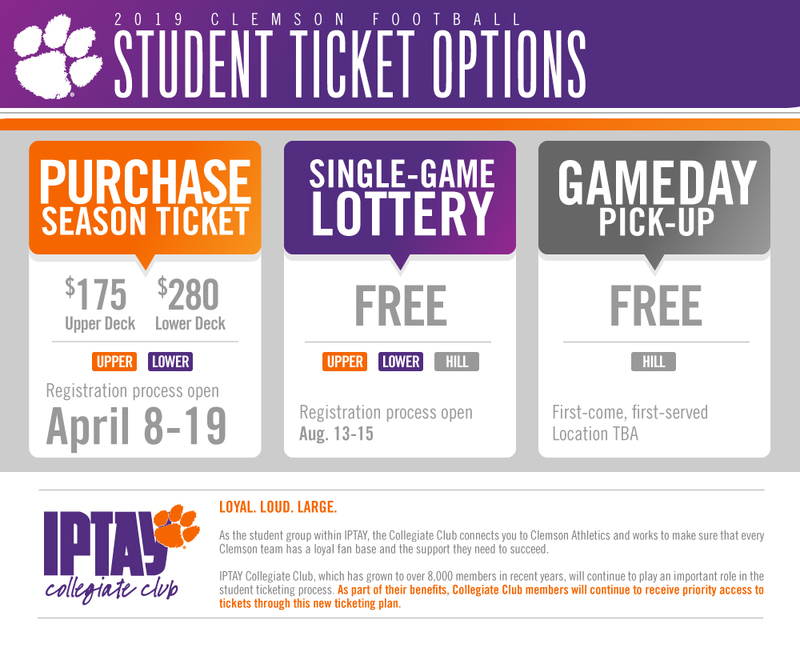 As the student group within IPTAY, the Collegiate Club connects you with Clemson Athletics and works to make sure every Clemson team has a loyal fan base at every home game. Since it began in 1997, the IPTAY Collegiate Club has grown to over 8,000 members. Season Ticket Benefit: IPTAY Collegiate Club members will receive an additional point in the Student Point System for each year of IPTAY Collegiate Club membership. For example, a senior with 4 years of Collegiate Club membership would have 8 total points. A senior with no years of Collegiate Club membership would only have 4 points. In order for your Collegiate Club Membership to count in the season ticket allocation you must join by 11:59 PM on Friday, April 19 (The last day to request season tickets). Single Game Ticket Benefit: For the single-game lottery, IPTAY Collegiate Club members will receive an extra entry in the lottery for each year of Collegiate Club membership. For example, a senior with 4 years of Collegiate Club membership would be entered 8 times in the lottery. A senior with no years of Collegiate Club membership would be entered 4 times in the lottery. In order for your Collegiate Club Membership to count in the single game ticket lottery you must join by 11:59 PM on Thursday, August 15 (The last day to request single game tickets). Click HERE to view a list of the discounts. Everything we do is in support of our student-athletes. Whether it is scholarships, academic support, training, facilities or operating expenses, IPTAY support is all directed toward the single goal of developing stronger, better prepared and better educated student-athletes. Now that you’re a Clemson Tiger, you don’t want to miss the best parts of being a Tiger – joining thousands of students, screaming at the top of your lungs, all orange, behind your team rain or shine – game days. Football, basketball, baseball – whatever the sport, being a part of the IPTAY Collegiate Club puts you right in the middle of the action. Join IPTAY Collegiate Club today by clicking here and filling out the application and either mailing it to IPTAY or stopping by our office, online, or by calling 1-800-CLEMSON.